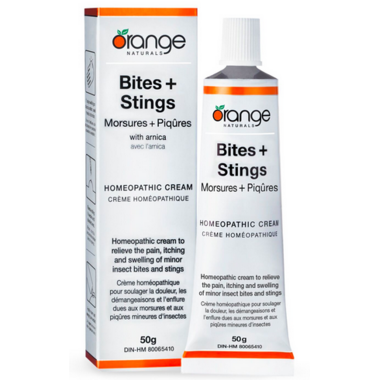 Orange Naturals Bites+Stings homeopathic cream relieves the pain, itching and swelling associated with minor insect bites and stings. Orange Naturals Bites+Stings homeopathic topical cream will help you find quick relief from those inevitable run-ins with mother nature’s tiny but mighty insects. Keep a tube in your picnic hamper, your backpack, the baby’s diaper bag, the bow of your canoe or your jacket pocket. Recommended Use: Topical homeopathic cream to relieve the pain, itching and swelling of insect bites and stings. Directions: Adults and children (0 years and up): apply generously to affected areas once daily or as needed. External use only. Medicinal Ingredients: Apis melliﬁca 1X, Apis melliﬁca 3X, Arnica montana 3X, Arnica montana 6X, Calendula officinalis MT,Ledum palustre 3X, Urtica urens 3X. Non-Medicinal Ingredients: Beeswax, shea butter, MCT oil, cetearyl alcohol, glycerin, tocopherol, sodium citrate, sodium lactate, carbomer, potassium hydroxide, purified water, lactose (trace amount only). Caution: Do not apply to open wounds or broken skin. Consult a healthcare practitioner prior to use if pregnant, breastfeeding or have a serious medical condition, and during use if symptoms persist, worsen or if new symptoms develop. Discontinue use if hypersensitivity (e.g. contact dermatitis) occurs. Do not use if seal is broken. Keep out of reach of children. My sister in law who is a naturopathic doctor uses this on her children, so when I had my twins I ordered it right away. Wonderful natural product to help heal bug bites.